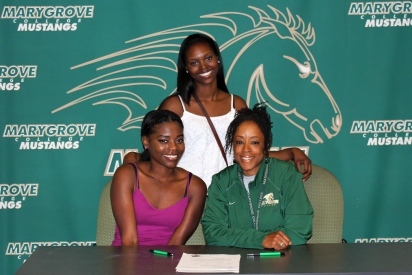 DETROIT, Mich. — On Tuesday (06/26), Coach LaCema Womack signed the first of two 2012 women’s track & field commits when Mercedesz Brown inked a 2012-13 Letter of Intent. The former Redford Thurston student-athlete will participate in the Mustangs’ indoor and outdoor seasons. Brown comes to Marygrove after enjoying much of her success on the soccer field at Redford Thurston High School. On the pitch, Brown was named Thurston’s Most Improved Player as a sophomore and Most Valuable Player the next season. Despite the soccer success, Brown is ready to commit full-time to track & field and is enthusiastic about the upcoming season. Coach Womack on Brown: Mercedesz brings experience and excitement to the women’s track & field program. She is enthusiastic about the opportunity that lies ahead and is ready to jump in and begin performing. I share her enthusiasm as I am looking forward to working with her this season.